Description: Optical equipment that can show a variety of effects. Description: A kit of optical elements to perform most optical experiments with ray diagrams. Description: The incidence of light such as a thin beam of light from a laser is reflected off the plane mirror at an angle identical from the normal of the mirror. The equal angles of incidence and reflection in relation to the normal of the mirror follow the law of reflection. Description: A light bulb socket is mounted upside down inside a box. Outside the box, directly above the socket, another light bulb socket is mounted. Only the socket inside the box has a bulb and power connected to it. By using a concave mirror, the bulb inside the box appears to be outside the box when the bulb is lit. When the power is turned off the bulb seems to disappear. Description: A laser is used with a bundle of fiber optics, a curled Plexiglas rod, and a 1″ square lean rod. As light passes through, the laser light is seen at the other end of the Plexiglas rod. Description: A lamp with optical fibers. Description: A large simple lens can focus the filament of an aircraft landing light onto the wall. Try to project an image with a thin concave lens. Description: The broken lens can be used to show a whole image of an object even though there is only half of a lens. The image is complete but less intense than the image projected by a full lens of the same size and focal length. Description: A tiny hole is made in the center of one side of a box and wax or opaque paper lines the side opposite the hole. When it is held up to a light source the image will show on the paper. Description: A model made of strings where each string represents a different ray. Description: A wire frame pyramid connects areas of 1, 4 and 16 units. Description: A pinwheel inside of a glass bulb with partial vacuum rotates due to infrared radiation pressure. Description: Vary the voltage to a 1KW light bulb with a variac to show color change with temperature. Description: Shine a laser beam through single slits of varying widths onto a wall. 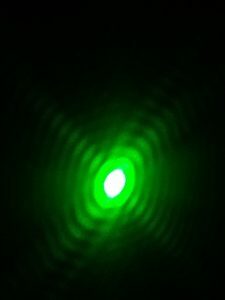 Description: Shine a laser through an adjustable slit of varying widths to view the changing interference patterns. Description: Shine a laser at a small ball or pin and look at the diffraction. Description: Slowly move a knife edge into a laser beam and view the interference due to the sharp edge of the blade. Description: Place a small diameter wire or human hair in a laser, for example a .22 mm diameter wire, and measure the diameter by the diffraction pattern. Description: View interference due to a circular opening. Pinhole is not quite a perfect circle. Can still see the interference pattern. Description: Shine a laser beam through double slits of different widths and spacing and observe the interference patterns. Description: A voltage modulated laser that optically transmits sound. Description: Various mesh and screens with various arrays that produce interesting patterns. Description: Newton’s rings will show interference patterns in the form of rings when placed on the overhead projector. The rings can be moved by adjusting the tension screws on the outer rim of the metal frame. Description: Reflect white light off a soap film onto a screen. Description: Use a Michelson interferometer with a laser. Pass the light onto a wall. Description: By using a microwave emitter and a detector, an interferometer can be fashioned. When the apparatus is configured as an interferometer, the wavelength of the emitted microwave signal can be determined. A speaker connected to the receiver will audibly indicate the intensity of the signal from the emitter. Description: Cyan, magenta, and yellow filters are available as loose squares or fixed in a Plexiglas holder for use on the overhead projector. Description: Three overhead projectors with filters of red, blue and green. Description: The sunset demo shows Raleigh scattering by using a 4L beaker, sodium-thiosulfate, and a catalyst. A particulate is created when the catalyst is added to the water / sodium-thiosulfate solution. The light that is projected to the wall changes from blue to orange red as the particulate increases. Description: Show polarization with two sheets of Polaroid and a pair of sunglasses on an overhead projector. Description: Rotate a Polaroid filter in a beam that reflects at Brewster’s angle off a glass onto a screen. Description: Use a second calcite crystal to show the polarization of the ordinary and extraordinary rays. Description: The sunset demo shows Rayleigh scattering by using a fish tank, thiosodiumsulfate, a catalyst, and a carbon arc lamp. A particulate is created when the catalyst is added to the water / thio solution. The light that is projected to the wall changes from blue to orangish red as the particulate increases. A rotating polarizer can be placed in front of the tank to show polarization by scattering.